Click the button below to add the Gaiana Nutritive Soap #Winter Care# to your wish list. Handmade Soap Made with Nutritive & Botanical Ingredients to Keep Dry Skin Hydrated during the Winter. This beautiful handmade soap is rich in skin moisturizing pure plant oils and butters, which create a softening lather and helps to seal in moisture. Our Gaiana Nutritive Soap is hypoallergenic, which is ideal for sensitive and dry skin. It is perfect to use during the cold winter and humid summer to keep the skin hydrated, smooth and radiant all year round. Try our Gaiana Nutritive Soap as a healthy alternative to chemically produced soaps that leave your skin dry, flaky and irritated. Made without Sulfates, Parabens, Alcohol, Artificial Fragrances, Dyes or Animal by products. Moisturizes skin without stripping nutritive oils from the skin. Can be used as a face and body soap. Avocado Oil is rich in fatty acids and vitamin E, which infuses the skin with moisture and softness. Castor Oil has anti bacterial and anti inflammatory properties to prevent breakouts on the skin and penetrates deep into the skin to inject moisture to the driest skin. Olive Oil restores the skin's smoothness with the assistance of vitamin E, polyphenols, and phytosterols. Do not let the soap sit in water. Keep in a dish to allow drying after each use. This method will keep your soap harder and longer lasting. • This soap can be applied daily. • Moisturize the skin of your body with our Skin Calming and Healing Lotion. For the face, use our Facial Lotion. • Keep your soap in a dry area to keep its shape. • If you want light moisture, we suggest our Winter Skin Care Protector. Persea Gratissima (Avocado) Oil, Ricinus Communis (Castor) Seed Oil, Cocos Nucifera (Coconut) Oil, Olea Europaea (Olive) Fruit Oil, Elaeis Guineensis (Palm) Oil, Elaeis Guineensis (Palm) Kernel Oil, Butyrospermum Parkii (Shea Butter) Fruit, Saponified. I have to say I absolutely love your products! I have been using the Giana soap bar and it is great! I also like the facial toner and nutritive serum! If you are sensitive to chemicals and have skin you would like to protect, this is for your face and body just wonderful. Other companies should use less chemicals or NO fragrance, and tons of people would not have skin issues. I love this soap. Most nutritive soaps dry your skin...not this one!!! 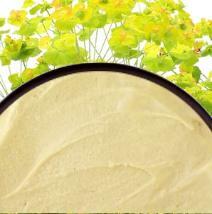 It's creamy, with lots of lather and leaves your skin soft. I was pleasantly surprised. Also, I have a friend that is allergic to almost every soap, and this one works for her. It's the only soap in my home now. Tired of soap drying out your skin? This nutritive one won't. Out-of-town guests couldn't stop raving about how "creamy and moisturizing" they found it. Worth twice the price. Brilliant. No scent, hypoallergenic. Could it get better? Great stuff. The only soap I will ever use. I have sensitive skin, and this is the only soap I use for face and body. I used every face wash under the sun, and this soap is THE BEST. It never dries it out my skin, and leaves it feeling soft, and looking great. I definitely recommend it for sensitive skin. This is a great basic skincare product. No, there are no artificial perfumes and yes, you need to keep it away from the water when not using it. It is good for your skin and cleans well with no drying residues. I love the nutritive ingredients for my sensitive skin type. My skin is thin and delicate. With eczema, I need a light protective coating on my skin to protect from bacteria. This nutritive soap bar, does this and leaves my skin feeling so soft and clean and free of allthat extra stuff put in store bought brands. Love it! This beautiful handmade soap is rich in skin moisturizing pure rich plant oils and butters which creates a softening lather and helps to seal in moisture. Won't strip skin like ordinary soap or leave it feeling sticky. Pampers even the most sensitive skin. For noticeably soft and supple skin - every day. Purchased this product for my husband as he has severely dry skin in the winter that develops red patches especially on the torso. Keeping dryness at bay, so far so good! I've been using it myself, nice lather even in our hard water.